You will learn how to prepare the best ceviche in the world. Our chef will lead you on this journey into the famous Peruvian dish, Ceviche. Our chef specializes in Peruvian Cuisine in which he applies modern techniques to recreate traditional recipes into special dishes. Traditional Ceviche: Ceviche is made right before you eat it. Ceviche Mixto: Seafood Ceviche could include, scallops, octopus, clams, snails, etc. Tiradito de Lenguado: Unlike ceviche, tiradito does not include onions, but the main difference is in the cut of the fish, which is sliced fine and then flattened. As most markedly been influenced by nikkei cooks’ treatment of fish. 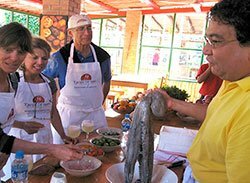 Culinary Curriculum:This class will give you the experience and knowledge needed to prepare the best ceviche and all related dishes such as Tiradito and other classic fresh seafood combinations. All tips and gratuities are OPTIONAL and up to you. Although not expected they are greatly appreciated.